Sandwich rage: what the 3@$!! do I pack for my lunch??? Can anyone point me to a source of packed/brown-bag lunch recipes that genuinely take no more than 5 minutes to prepare, and aren't overreliant on peanut-butter-and-banana sandwiches? Bonus points if it isn't all mimsy about low-fat mayonnaise and such. Also I only have an English freezer, so batch pre-prep is out. In an effort to stay on budget, I have consulted innumerable packed-lunch recipe sources over the years. The first was a book called "The Brown Bag Lunch" which proclaimed that its recipes would "save you time and money!" I would eat the same lunch every day for efficiency, and every Sunday I would spend four hours poaching chicken breasts and making biscotti. Then I would slack off and berate myself for my lack of moral fibre. Then I looked on various websites, and was able to find a variety of scattered, incoherent suggestions like: "try banana and peanut butter! And for a change of pace, why not try peanut butter and banana instead!" Or else it would be: salad! gazpacho! stay up all night chopping vegetation!!! Faff around getting the blender out. I know you're tired from a realllly long day at work, but don't forget to put the lid - oops. That'll keep you up cleaning all night! Or: batch prepare this chili and reheat it in the microwave! Well, I don't have a separate room just for my deep freeze, so unless I can pour the chili into my freezer directly so as to make clever and efficient use of the amorphous spaces between the abandoned chicken breasts and the ice cubes, I won't have anywhere to put it. Plus, when I get to work I realize we don't have a microwave. I don't have time for all this. I have the same lunch every day: four different kinds of fruit, plus a frozen juice box to keep it all cold. A little hunk of cheese. A sandwich of some kind. Well, of peanut butter because I can't think of anything else. A pudding which is usually custard because I also can't think of anything else. Where can I find ideas for what could go in the place of the peanut butter sandwich and the custard, but won't take more than 5 minutes to fix, as in 5 actual minutes rather than 5 Martha Stewartesque minutes? And which doesn't rely on processed/industrial food? Ideally it also won't get mimsy about "low-fat mayonnaise on coconut matting bread" or "half an egg white sandwich with eight baked potato chips". You literally cannot think of a sandwich filling other than peanut butter? Mini pork pies are a good packed lunch addition too. I often have breakfast for lunch. I'm assuming you have access to a fridge at work. I take in a Lock & Lock containing a decent portion of Dorset Cereals muesli, onto which I have poured enough fruit juice to make it moist, but not wet (I don't like milk with muesli). I eat it with some fresh berries on top, or banana, chopped up apple/pear and with a small probiotic yoghurt to top it off. If you don't like your muesli as moist as I do, pour the juice over it about 10 minutes before you intend to eat it. On Sunday, I buy a loaf of artisan bread and a four-ounce package of goat cheese. I take the cheese to work on Monday along with four slices of the bread. Every day, I bring four more slices of bread, and use another ounce of goat cheese. (we order in lunch on Wednesdays.) At the end of the week, I've eaten the whole loaf of bread and teh whole thing of cheese. You can mix it up - different breads, rosemary bread, with plain cheese, plain ciabatta with a flavored cheese...A accompany these with a couple pieces of fruit and a yogurt cup. Unless you're a vegetarian or on a non-dairy diet, the range of sliced cold meats, cheeses and other sandwich fillings would seem pretty huge. Find a deli somewhere. About half of the stuff they sell will either go in or around a sandwich. I like to take a pita or lavash, lay out a few slices of Tofurkey (or real cold cuts, if that's what you're into! ), throw on some spinach or other salad greens, maybe some goat cheese crumbles, maybe some sliced plum tomatoes, and then add mustard. Takes maybe a minute or two, contains lots of protein and veggies, and is delicious. Other easy options are oatmeal, or yogurt with granola or fruit thrown in. Or, if you're willing to cook once a week, make a big batch of rice and beans and then divvy up a tupperware portion each morning. On Sunday, I buy a loaf of artisan bread and a four-ounce package of goat cheese. I take the cheese to work on Monday along with four slices of the bread. Every day, I bring four more slices of bread, and use another ounce of goat cheese. Ah yes, I do the same but with paté instead of cheese. On a side point, what' s an "English freezer"? What's special about them that you can't put lunch in them? 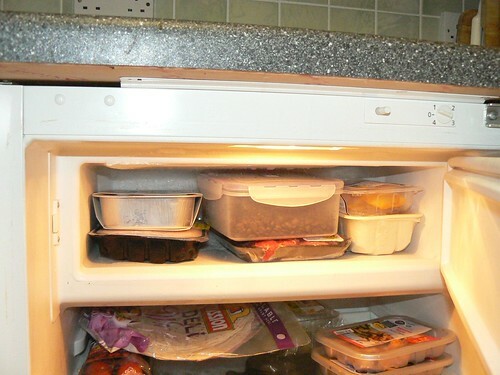 curious_yellow, many English fridges are 'under-counter' fridges with a small freezer. 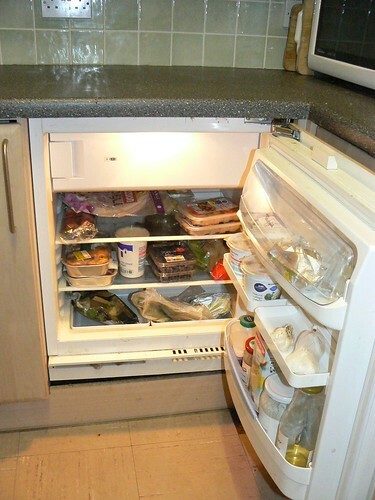 Here's a picture of my fridge, the freezer being the small compartment at the top. Here's a brown bag hack - when putting condiments on your sandwich, spread them between the meat / cheese layer. If you spread them on the bread it will make your sandwich soggy by lunch time. Use the cheese as a protective barrier! -I hope that made sense. Also, I usually buy a half pound of 2-3 kinds of meat and rotate between them for sandwiches during the week. Hummus sandwich with cucumber can also be fast and delicious. I also keep a Tupperware bowl in my desk, and bring a can of soup daily. Leftovers from dinner make an exciting addition: today there's going to be salmon on the whole wheat pita. Snacks and side dishes include cherries, string cheese, a small Fuji apple and some Trader Joe's crackers. I don't do lunch meat or mayo, but I do like lots of lettuce, onions, pickles and tomatoes on a kaiser roll with some kind of cheese and some mustard. Also, Morningstar Farms Chik-patties are full of fake-chicken goodness and can be microwaved before adding to a sandwich like the above. Bake a couple chicken breasts. Douse them with some sort of seasoning (maybe a couple different ones). If you're good with a knife, slice them at an angle (imagine you're a sushi chef) as thin as you can, and you've got sliced chicken for sandwiches. If you're not up to the knife thing, just roughly chop it in chunks, and you've got stuffing for pita. If you add a bell pepper to the pan, you've got roasted bell pepper slices to put in your sandwich/pita. Same with slices of onion. As for time, when you get home, turn on the oven. Drop you're stuff off, check your mail, then pull out a couple boneless/skinless breasts, season them, toss them in the oven, they'll be done in about 20 minutes. Pull them out, let them cool. The actual cutting of the breasts is the only thing that will take any time. For fun, add some apple-smoked bacon to the sandwich. Also, the secret to a happy sandwich is liberal sprinkles of oregano. It's bliiiiissssssss. - Egg salad (use paprika, add capers or olives, trust me it's not a gross cafeteria food). - old cheddar, green apple, avocado on raisin bread. Deli meat (turkey, ham) can go in there too unless that's too processed. - Tomato, cucumber, avocado, tofu if you need some proteins (sautee it in a pan w/garlic the night before, it will take two minutes). - Get a little sectioned tupperware, make a little kitchen plate in there: hardboiled eggs, olives, pickles, crackers, salami, cut veggies, cheeses. - Make rice and beans the night before (not a huge investment in time). Put in tupperware with chipotle peppers and fresh tomato and avocado. - Couscous (takes 3 minutes to cook) with yogurt dill sauce, sultanas, scallions, feta, tofu bits or whatever else you like. - Brie and a baguette. Drizzle with honey and walnuts. Your Britishisms amuse me. I'm not sure if this is what you're going for, but I'm making the assumption that in addition to "less than five minutes to prep," you also want something that will last until lunch with only the frozen juice box for cooling, won't smash in the sack with all the fruit, and will give you some nutrition. A hunk of salami or hard meat. Just slice! Hard-boiled eggs, sprinkled with paprika. Turkey bacon rolled around pickles, asparagus, whatever is around. This usually comes precooked, too. Deli-cuts rolled up in a tortilla. Deli-cuts smooshed inside a pita. An avocado, and a spoon. Yes, the deli is your friend. Lots of different meats, cheeses, pickles, salads and relishes. Your sandwiches don't have to be boring at all, and a small plastic takeaway box filled with yummy cold-cuts can be tucked handily away in even the smallest freezer. But in answer to your question, here's a link. To be annoying, I'll follow myself up by saying that okay, so none of those can be prepared in 5 minutes, but if you enjoy yourself by cooking them say the night before than it will only take 5 minutes for you to extract them from the fridge or freezer (if you've been clever youv'e cooked enough for a few days and the tedious part is over) and then leave the house, lunch in hand. My go-to brown bag lunch is a thin sliced bell pepper, chunked avocado, cherry tomatoes and shredded lettuce tossed into a tortilla. It doesn't take me more than 5 minutes to make it and I pretty much always have the ingredients on hand. Thanks, peeps, keep the suggestions coming. I'm hanging on your every word. h00py, the link you showed me is very close to what I want. I would love to "enjoy myself" cooking things the night before but I have a four-hour commute every day. I often work long hours and have no time for recreation at all, and I struggle to find time to take care of myself. I usually have to choose between eating dinner and getting enough sleep, for example. I understand why people think that things can be crammed into a very small freezer, but my very small freezer is already crammed and it's not my own. I often have difficulty even fitting the juice box into it. I feel your pain. Enjoy was a bad choice of word. But perhaps if you can clear a space and just one night a week whip up a batch of fritters (which can last for at least three days in the regular fridge and are pretty simple - one cup of flour, one cup of milk, one egg, salt and pepper, anything else you want) or something like that then lunch is covered for a while. And all mayonnaise will henceforth go inside the sandwich filling and will contaminate not the bread thereupon. My lunch for the last year or two has consisted mainly of a variety of fruits and a PB&J sandwich on some awesome, hearty, multigrain bread. The fruits give me something to snack on throughout the day to keep my blood-sugar up and the super thick bread with the protein of the peanut butter gives me that "full" sensation when I'm starting to feel the hunger (which is why I generally eat the sandwich in halves an hour or so apart). In the fall, since apples were in season, I would take ~5 medium-to-large apples to munch on. Now, since it seems to be berry-and-drupe season, I find myself eating a lot of strawberries, blueberries, peaches, plums, etc. And, since it's always banana season, I usually eat a banana a day. Change spreads: mustard, hummus, pesto (you can buy it prepared in a huge variety of types), cream cheese, guacamole, cranberry sauce/jelly, even mashed potatoes! (After American Thanksgiving I love me a turkey sandwich with some kind of cheese and cranberry sauce as the spread!) Lots of "smooth" side dishes can be sandwich spreads; think what kind of meat you'd eat them with at dinner, then spread it on a sandwich featuring that kind of deli meat. Change breads: pitas, bagels, flatbread sandwich rounds, fancy breads, normal breads, etc. Change fillings: You can get prepared salad meats (cooked, in small chunks, in a "ziploc" type bag) that stuff nicely in a pita; try different veggies -- tomato, lettuce, sprouts, avocado slices, etc. ; try different cheeses/fancy cheeses; even try things like couscous or a cold bean salad. Some of these are easier to stuff in a pita, but some work on a sandwich too. take a lemon, zest it. dump juice and zest on chickpeas. using your clean hands, grab handfuls of chickpeas and squeeze until about 2/3 are no longer intact. add a couple of glugs of olive oil. this can be used as a salad or as a sandwich filling. it tastes better the second day, but is still pretty good the first day. also, omelet sandwiches are good. - custard pudding....layered with fruit and whip cream! Here in the US we have a brand of packaged lunch called Lunchables. They're basically small slices of meat (usually turkey or ham) with small slices of cheese (usually cheddar or swiss) with crackers. They are usually too expensive for what you get, so I've taken to making my own. I go to the deli and get ham, turkey and cheese sliced about 1/4 inch thick (about 1/2 cm I think) then I take the slices home and cut them down to pieces about 2 inches square (4 cm if I'm doing the metric thing right.) I slice the whole pile of meat at once, so it really only takes me a minute. Then I separate the piles into daily portions and put them in zip top bags in the fridge. Then I can just grab a bag of meat and a bag of cheese and go. Using the buttery crackers (they're called Ritz here) I can make little sandwiches with different kinds of mustards to dip the whole thing in, or I can just munch on the pieces separately. I usually add in fresh fruit to round out the meal. It literally takes 5 minutes to prepare for the whole week. This kind of thing might be a good thing for you to have in the fridge for the days that you don't have time to make a full sandwich. This doesn't exactly count as "batch cooking", but once a week make a salady-thing in a storage container. Buy a bag of pitas. Scoop some salad stuff onto a pita each day. Pre-washed salad greens, tortilla chips, and fruit can round it out. These are all prepared, more or less, by chopping a few veg, and opening a few cans. These will all keep in the fridge for a week. I bring stuff to work at the start of the week and assemble my sandwich each lunchtime. Favourites are houmous or falafel in pitta with salad and yogurt/mint dressing, or avocado and deli chicken (those wee chicken bits) in a bagel. Brie and cranberry on a bagel would be nice, I reckon. When I have a week during the summer when I'm with the kids during the day, I avoid the drive thru by having lunch at the ready that we just pull out each day. Takes 2 minutes to assemble both the kdis and I love it. "Mini-trees" of blanched and shocked broccoli cut to bite size. Cubes of luncheon meat. I ask at the deli counter not for slices but 1/2lb chunks which I cut into 1/2in cubes at home. Pretzel Sticks, sesame sticks, and other non-fried crunchy carb snacks. My kids love croutons, FWIW. Nuts like Honey roasted peanuts or glazed walnuts. And, as a treat/incentive, malted milk balls, goobers, or other bite-sized candies. Assemble this once and then set all the items in a box/tray in the fridge and viola!, quick lunch that will not make you feel deprived for not eating out. They key is to throw in one or two "look forward to" items, luxuries that you don't get to eat often like fresh cherries in season or chunks of Valrhona dark chocolate. Who said that your lunch has to be a sandwich? The thing that changed my life when it came to packing lunches was: salads. Now that it's summer, I tend to have a lot of chilled noodles/salads in the refrigerator anyway -- typically a mix of some hearty grain-based things and some single-vegetable things, usually things leftover from dinner (I am incapable of making a single-serving size of anything). Sometimes I even spend a couple hours on the weekends making up a couple things (usually the "cooking" in this case takes no more than chopping vegetables and mixing them in a container, then sticking them in the fridge). Then, lunch is nothing more for me than simply picking a couple of them, dishing some into smaller containers, and taking them to work. I do have to take the containers back home, but this is a small matter. there are SCORES of salads you could go with - grain- or bean-based ones (black bean salad, tabbouleh, etc. ), or you could get some egg or chicken salad together and just eat it on a bed of greens; there are even chilled soups like vichysouisse or gazpacho. You could mix and match a whole assortment for different menus every day. Two small containers of salad and/or soup, and add a cookie or an apple, and you're good. Thanks, hive mind. My luncheon woes are over!!! From now on, lunch will be the center of my temporal day, and I will be leading a blissfully organized life! If you find yourself hurting for variety down the line, don't forget that chicken or tuna or egg salads can be made more than one way. If you're making chicken or egg salad at home, add some curry powder to the dressing and some fruit (grapes/raisins, apples) and slivered almonds to the salad. I love tuna salad with finely chopped sweet pickles (or relish) and apples, or with dill and onions. If you don't need dessert to be seriously sweet, and you can get greek yoghurt in single-serve containers, it's lovely with honey and nuts or fresh fruit like berries or melon chunks, and the fruit can sometimes be purchased prepared if you can't store or prep it at home.